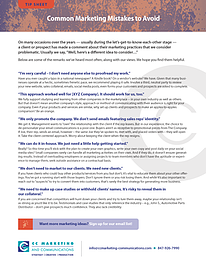 "We don't need to market to our clients. We need new clients." We get it - you want more business. (If you didn't, you wouldn't be reading this right now.) But are you doing everything possible to deepen the relationship you have with existing customers? Probably not. In this quick-read resource, we address this marketing mistake as well as 5 others we've heard countless times. You'll benefit from our insights on these common "choices" and our alternatives based on years of working with a variety of types of businesses. Download Common Marketing Mistakes to Avoid today!